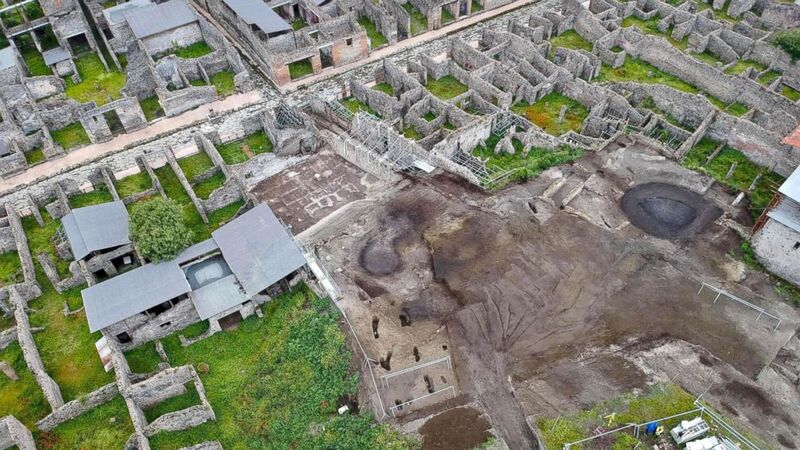 Amazing discovery of a large villa outside of the city of Pompeii, Italy. 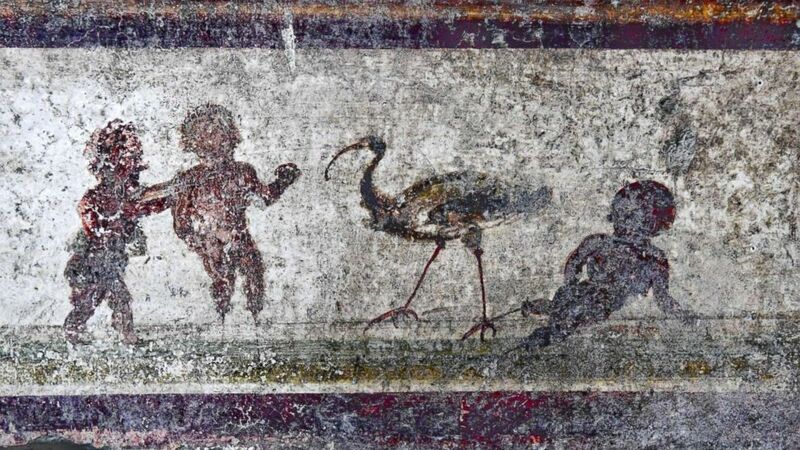 camera (Ciro Fusco/EPA via Shutterstock) Part of a fresco at domus delle Nozze d'Argento in Pompeii, Italy, May 17, 2018. Mt. Vesuvius, near the city of Pompeii, Italy, erupted in 79 A.D., wiping out an entire town. Hundreds of years later, archaeologists found a perfectly preserved city buried in ash and frozen in time. (Ciro Fusco/EPA via Shutterstock) Amphoras recovered during excavation works at the archaeological site of Pompeii, where the 'Vicolo dei Balconi' (Alley of Balconies) was recently uncovered in Pompeii, Italy, May 17, 2018. (Ciro Fusco/EPA via Shutterstock) One of the rooms of the Domus Nozze d'Argento (room of the Silver Wedding) in Pompeii, Italy, May 17, 2018. 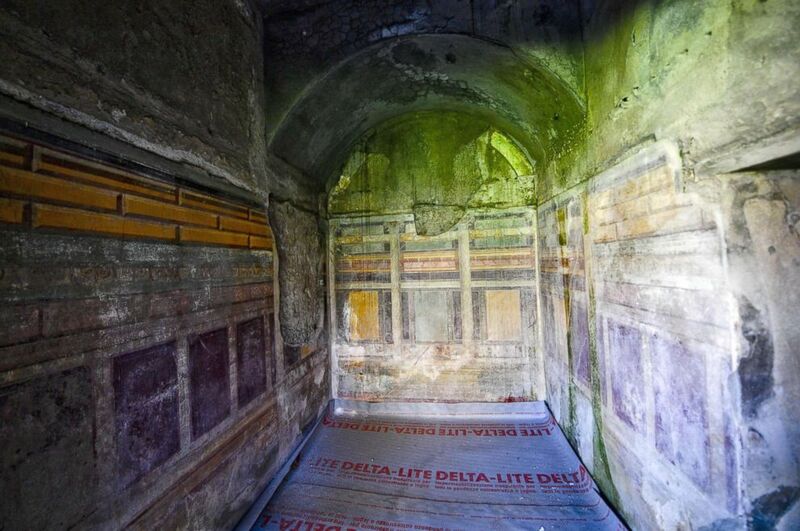 Just recently, an extraordinary discovery was unearthed in a large villa that stood just outside the walls of Pompeii, far from the known archaeological area, during a joint operation of the Carabinieri of the Cultural Heritage Protection Center and Pompeii archaeological superintendence. 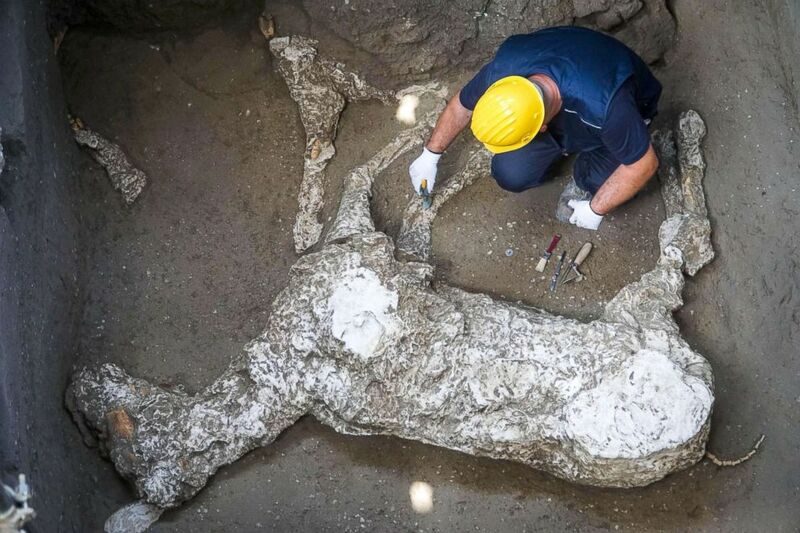 (Cesare Abbate/EPA via Shutterstock) An expert works on the whole cast of a parade horse found during excavations at Pompeii, Naples, Italy, May 10, 2018. (Ciro Fusco/EPA via Shutterstock) Excavation works at the archaeological site of Pompeii, where the 'Vicolo dei Balconi' (Alley of Balconies) was recently uncovered in Pompeii, Italy, May 17, 2018. 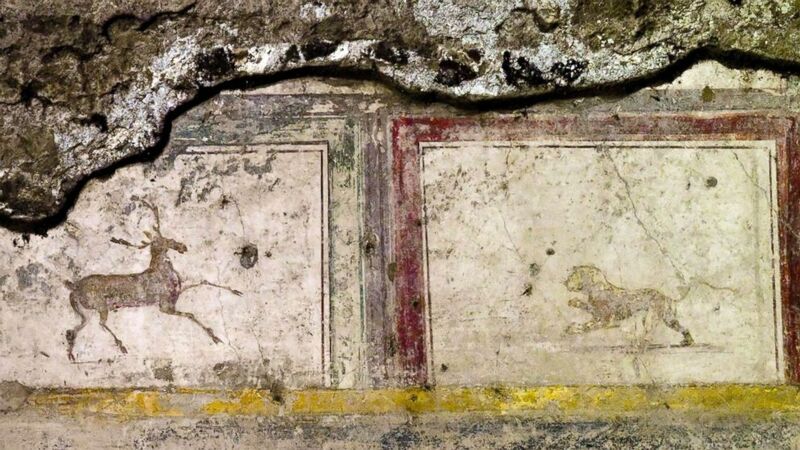 Archaeologists working at the site uncovered buildings with big balconies have Pompeian red colors and geometric decorations of flowers and animals. They named it the 'Vicolo dei Balconi' (Alley of Balconies). The area was previously unexcavated. (Sanp Pompeii Handout/EPA via Shutterstock) A handout photo made available by The Special Superintendency for the Archaeological Heritage of Naples and Pompeii (SANP) shows aerial view of the excavation works at the archaeological site of Pompeii, where the 'Vicolo dei Balconi' (Alley of Balconies) was recently uncovered in Pompeii, Italy, May 17, 2018. (Ciro Fusco/EPA via Shutterstock) The domus delle Nozze d'Argento shows part of a fresco in Pompeii, Italy, May 17, 2018. 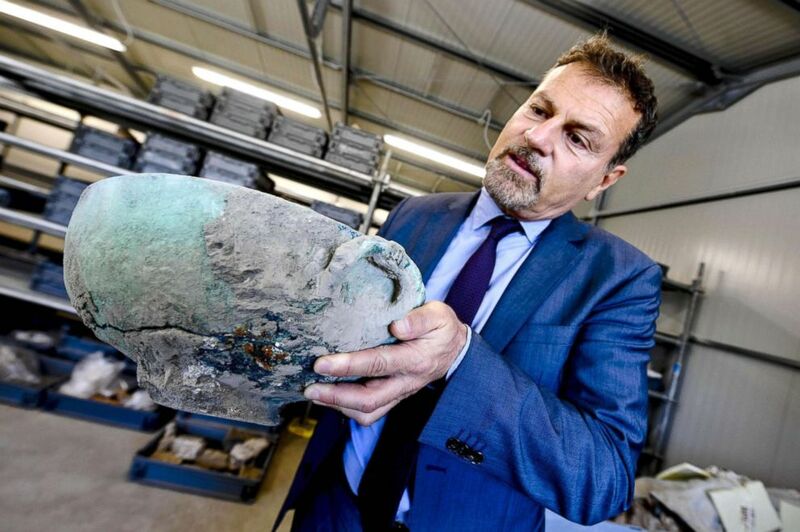 (Ciro Fusco/EPA via Shutterstock) Massimo Osanna, Superintendent of the Special Superintendency for the archaeological heritage of Pompeii, Herculaneum and Stabia shows a bronze vase discovered during excavation works at the archaeological site of Pompeii, where the 'Vicolo dei Balconi' (Alley of Balconies) was recently uncovered in Pompeii, Italy, May 17, 2018. (CiroFusco/EPA via Shutterstock) One of the rooms of the Domus Nozze d'Argento (room of the Silver Wedding) in Pompeii, Italy, 17 May 2018. 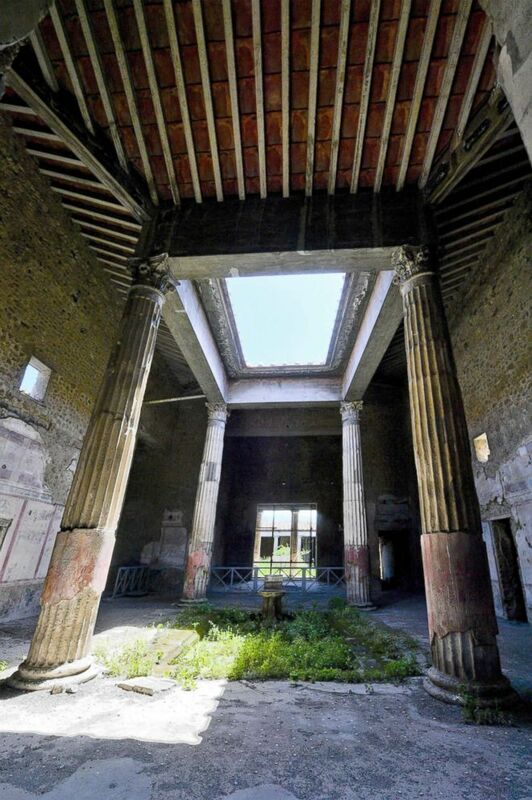 The Domus has a huge and sumptuous atrium with four Corinthian columns more than 26 feet high, multi-colored frescoes, refined floors and a small private spa decorated with mosaics and frescoes depicting lions, wild boars and panthers. 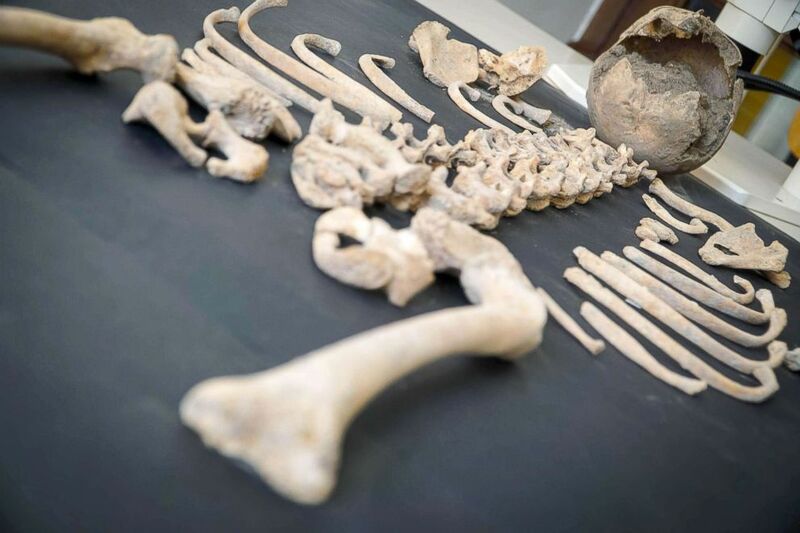 (Cesare Abbate/EPA via Shutterstock) A skeleton of a child found during new excavations in the ruins of Pompeii, Naples, Italy, April 27, 2018. 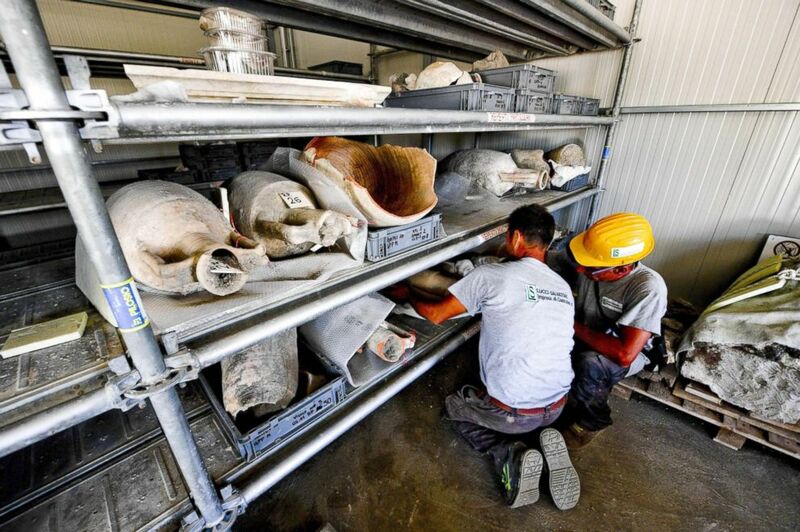 The remains will be examined in the Applied Research Laboratory of the Archaeological Park of Pompeii. Anthropological studies will include a first screening of the young victim's state of health and then direct the subsequent external investigations on DNA. Almost 2,000 years after the eruption of Mt. 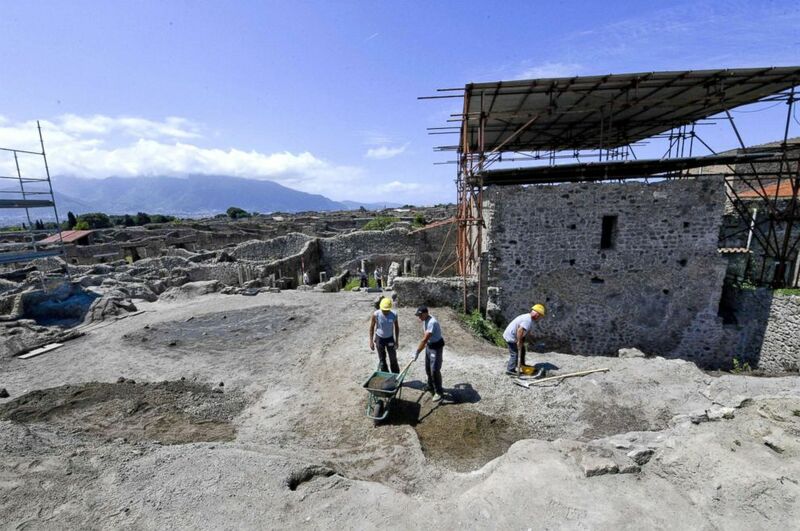 Vesuvius and decades of excavation, the newly restored areas will be on view to tourists who want a deeper insight into Roman life from years long gone.